3 soverom vann foran hytte på vakre Songo Pond. Blueberry Cove Cottage er en 3 soverom, 1. 5 bad, vannkanten hytte perfekt for en familie på 4, plass til komfortabelt 6 og sover opp til 8. Det ligger i nærheten av Sunday River Resort og Bethel Village. Nyt fotturer, golf, kajakkpadling, kanopadling, svømming og sykling. Den Appalachian Trail, Shelburne NH Trails og Mahoosucs er bare noen få fotturer i nærheten, eller en kort kjøretur til Rangley er vakker i høstfarger. Kano ikke bare Songo, Lake Christopher, Round, North og South dammer er i nærheten av å ikke nevne Androscoggin River har noen av de beste fly fiske i New England. North Conway New Hampshire, tax free outlet shopping er like under en 1 times kjøretur nær Mount Washington. Eller på under 2 timer kan du kjøre til kysten, Freeport, ME hjem til L. L.Bean og uttak shopping og vakre strender. Blue Berry Cove Cottage er en vakker Maine retrett bygget i 1930 som sitter på 2 hektar på kysten av Songo Pond. Nyt morgenkaffen din og lytt til løene fra to private havna! Utleie inkluderer bruk av 3 kajakker og kano på eiendommen. Og ja, det er vill blåbær planter i hele eiendommen! Songo Pond, med et areal på ca 1 kvadratkilometer og 196 dekar, ligger i den nordlige delen av det uorganiserte territoriet Albany. Det er kilden til den krokede elva som til slutt kommer ut i Sebago Lake i sør. My co-worker and I wanted a getaway for the weekend and I found this lovely cottage on HomeAway with great reviews and pretty pictures of the property. We got there and we were all excited after seeing the cottage since the first minute! This cottage and the property were nothing short from what people praised about. The cottage was clean and spacious, big kitchen and all ready-to-move-in cooking wares. Tons of windows for the natural light and surrounding views. Cute decorations and nooks for a full submersion into the coziness. Big picnic table, a grill, and a fire pit! One big canoe and three kayaks for all of us to spend the afternoon on the lake. The bonus was the morning fog on the lake that looked just right out of a fairy tale. Thank you for sharing your lovely cottage! We will come back. Awesome, thank you!- so glad you enjoyed the cottage! We look forward to your return! This place is nothing short of amazing! The owners are very friendly and the cottage is immaculate! Everything you need and more! We will definately return. Thank you!! We look forward to your return!!! The place was as advertised. All the other reviews were spot on. The scones are delicious! A must go is to that pie stand, amazing. One of the most relaxing vacations I’ve had in quiet a while. You will not be disappointed staying here. Great experience. We stayed there a night, six adults and 2 kids. Everything was clean and well maintained. The scenery is fantastic with nice lake. There are canoe and kayaks available to use, large fireplace to gather around. Erika, who met us, was very friendly. We will certainly consider going back again. Thank you! We would love to have you back again, maybe for a longer stay!! 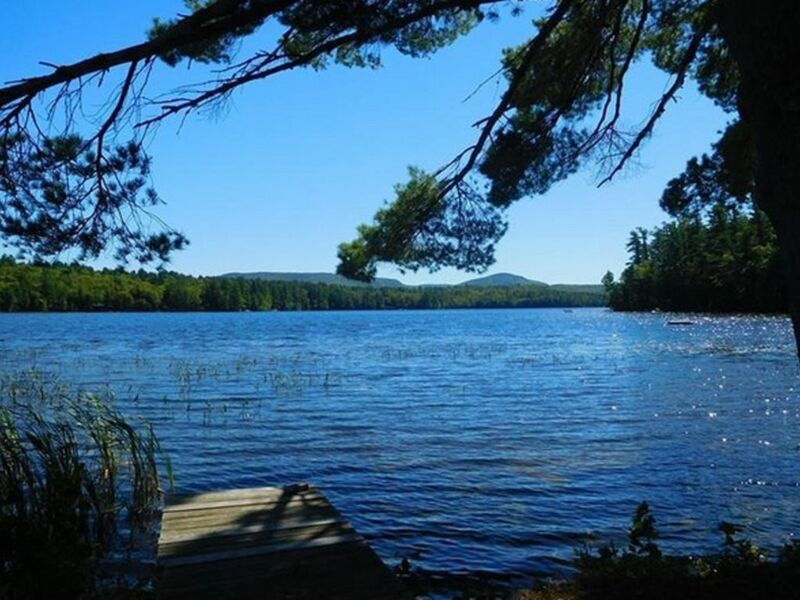 We enjoyed our stay at Bethel, the cottage is charming with beautiful views of Songo Pond, 2 bedrooms have sunrise views of Songo Pond, and our dogs enjoyed the fenced in yard. We would stay there again, there is lots to do! Well-appointed home with kayaks and canoe to explore peaceful lake. Kitchen fully equipped, beds very comfortable. Bathrooms small, but manageable. Had issues with low water pressure toward end of visit, but Erika immediately called plumber. Quick drive into Bethel and close to numerous hiking options.